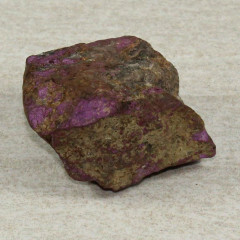 Purpurite is an interesting purple Manganese mineral, prized by collectors. Purpurite is a pinky purple Manganese phosphate mineral, with a lovely colour to it. The name comes from the Latin word “purpureus”, meaning ‘purple red’. The colours vary depending on the amount of Manganese content, of course! Purpurite is pretty much only used as a mineral specimen – it has no widespread use in industry. There are some pieces of jewellery and loose cabochons floating around too, though. Its name comes from the Latin word ‘Purpura’, which means purple. Manganese Phosphate, with the formula Mn3+PO4. It measures between 4 and 5 on the Mohs scale, and has a specific gravity of between 3.2 and 3.4. If you’re looking to test this mineral, use white streak plates – the streak is typically red. Purpurite is found in a few different places, including Mexico, Sweden, the United States, and Spain. Some excellent specimen pieces are found in Portugal and Namibia. We offer some collated information on the supposed crystal healing and metaphysical uses of crystals below. However, we believe crystals and crystal healing should be used alongside medicine and treatment options, not instead of them. Crystal healing can be a great way to keep a positive mindset during hard times, and it may complement any other medical treatments you are undergoing. People believe Purpurite is a stone that helps with confidence, especially in speaking. It may help you to vocalise your inner thoughts more accurately. It is also said to help you figure out and clear your self destructive thoughts, and any self imposed limitations. We do not recommend making ‘gemstone elixirs’ in general – whether you’re using a gemstone, mineral, crystal, or glass. If you do choose to make elixirs we would recommend an indirect method, either by placing a glass full of stones into your elixir container, or by placing the stones around the outside of your elixir container. Some people suggest using Quartz points alongside these stones in order to amplify and direct the energy into the water. Some people believe Purpurite is perfect for using on the Crown chakra. Others believe it can be used with the Third Eye chakra, aiding your ability to see with your inner eye and understand the spiritual meaning of what has been happening in the world. Most sources seem to suggest Purpurite is perfect for use by Virgos.